Derry City manager, Kenny Shiels has compared his side's recent loss of form to Novak Djokovic's downward spiral. KENNY SHIELS has compared Derry City's recent poor form to tennis star, Novac Djokovic's dramatic fall from grace and claims it isn't 'rocket science' why his team have gone on a downward spiral. 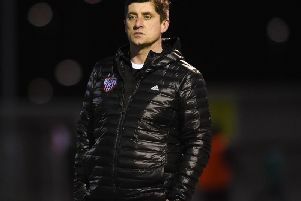 The Candy Stripes appear to be on a steady decline and Shiels admits they have lost their self-belief after recent losses to Dundalk, St Pat's, Waterford and now Sligo in their last five league matches. However, the Co. Derry man isn't getting carried away and is confident his side can turn it around and perhaps cause a major upset in Cork on Monday night. "When you're in a positive momentum everything flows," he explained. "Whether you're an artist, or an author of a book, when you're in a positive momentum everything falls into place. "When you're in a negative momentum everything fragments, it breaks up, Things go wrong and decisions go against you - that's sport, believe me! "You can't just say, like someone said to me tonight, we weren't determined enough. Determination is governed by how people think. Is it easier to get out of bed on a Monday morning or a Friday morning? The same things happen on a sports field. How come people have got momentum and they're winning 100 m sprints or whatever and all of a sudden they go on losses? "Look at Djokovic the tennis player. For years it was positive, positive, positive, He got an injury and then went on a negative downward spiral. It happens. Some people will labour on it but I won't labour on it. I'll work on it, improving how I deliver and how I work and I expect that to fall into the players' transition, moving from negative to positive. "They're lacking confidence," he agreed. "Everybody talks about other players wanting it more than us but it's not about want it's about belief. The players are going through a hard time at the moment in terms of the abundance of fixtures. "They're going through a hard time because they've lost themselves and their self-confidence and these are contributing factors. We've got to get ourselves back to thinking about how well we can do in our next game and looking to the future. Look forward and not back and get that elusive win and maybe against a big team like Cork would be a fantastic opportunity to do that."